The United States accused Pakistan on Tuesday of playing a "double game" on fighting terrorism and warned Islamabad it would have to do more if it wanted to maintain U.S. aid. "They can do more to stop terrorism and we want them to do that," White House spokeswoman Sarah Sanders told reporters. "There are clear reasons for this. Pakistan has played a double game for years," Haley told reporters. "They work with us at times, and they also harbor the terrorists that attack our troops in Afghanistan. "That game is not acceptable to this administration. We expect far more cooperation from Pakistan in the fight against terrorism." The comments followed an angry tweet from President Donald Trump on Monday that the United States had been rewarded with "nothing but lies and deceit" for "foolishly" giving Pakistan more than $33 billion in aid in the last 15 years. "They give safe haven to the terrorists we hunt in Afghanistan, with little help. No more!" he tweeted. 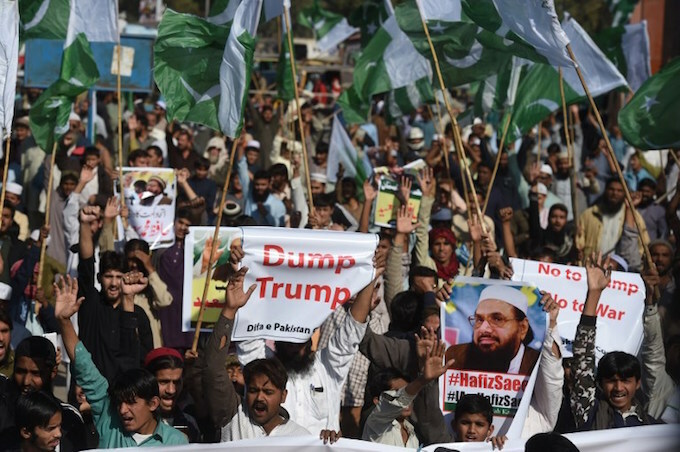 Pakistan civilian and military chiefs on Tuesday rejected "incomprehensible" U.S. comments and summoned American Ambassador David Hale to explain Trump's tweet. The United States also alleges that senior Afghan Taliban commanders live on Pakistani soil, and has signalled it will cut aid and take other steps if Islamabad does not stop helping or turning a blind eye to Haqqani militants crossing the border to carry out attacks in Afghanistan. At the State Department on Tuesday, spokesman Heather Nauert said Pakistan knows what it needs to do, including taking action against the Haqqani network and other militants. Pakistan needs to "earn, essentially, the money that we have provided in the past in foreign military assistance," she said. Pakistani Prime Minister Shahid Khaqan Abbasi on Tuesday chaired a National Security Committee meeting of civilian and military chiefs, focusing on Trump's tweet. The meeting, which lasted nearly three hours, was brought forward by a day and followed an earlier meeting of army generals. The committee, in a statement issued by the prime minister's office, did not name Trump but spoke of "deep disappointment" at a slew of critical comments coming from U.S. officials over the past few months.